What’s not to like about a beautiful photo, with the sky reflected back in a rippling pool of water? We put up with the king tides of winter, and some of us (East Pier and Gate 6 1/2, the further end of A Dock parking where 2 or 3 spots are routinely out of commission, and especially Commodore) suffer the summer tides as well. We’re not alone. 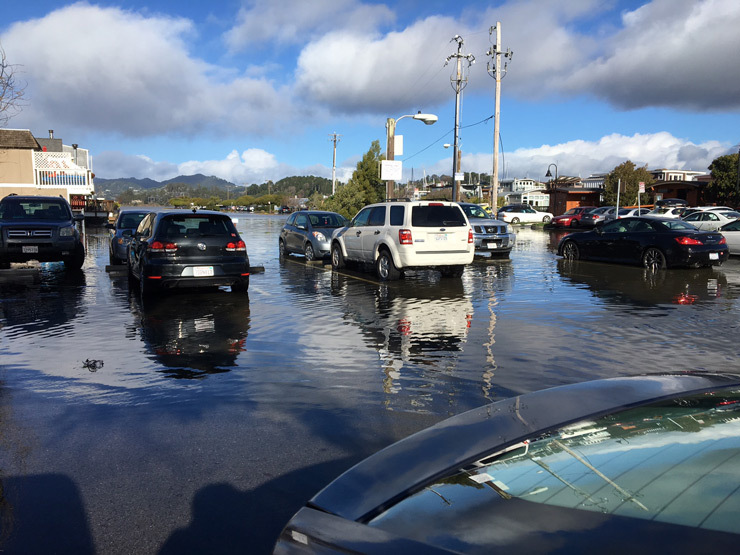 This year, Marin County and the City of Sausalito’s Sustainability Commission each made sea level rise a priority. In our own community, Waldo Point Harbor employs both sea walls and floating docks (Van Damme), while Kappas Marina inches up the parking lots (6 inches being the max one can add without applying for planning). These short term strategies work, but what of the long term and what of the surrounding community and businesses, all of whom are affected by flooding, storm surges and increasingly higher tides? One group looking for solutions—Resilient by Design—(see the update below, and read the previous story: Sea Level Rise — Resilient by Design) has reported an overwhelming response to their call for entries: 51 interdisciplinary teams of designers, engineers, scientists, students and more have applied. The 10 winning teams—along with the 10 specific scenarios they will be designing for—will be announced in September. A simple way to understand the underlying principals driving this program is by way of Henk Ovink (International Water Affairs, Netherlands) whose thinking and initiative informed the Hurricane Sandy Rebuilding Task Force, the resulting Northeastern Rebuild by Design program, and now informs the current Bay Area Resilient by Design. It’s all laid out in the April 2014 article How to Think Like the Dutch in a Post-Sandy World, written for the New York Times by Russell Shorto. A follow up piece A Dutchman’s Opinion: Henk Ovink Weighs in on Post-Sandy Proposals highlights the 10 proposals put forward by the Task Force. This is a quick read and the best indicator of the types of innovations and innovative thinking we can expect to see when the Resiliency Project’s designs are revealed in May 2018. These articles help us to understand that one town can’t tackle the problem (of sea level rise) without passing the problem on to a neighboring community. And that ultimately, if there is any hope of resolving the problem on a larger scale, the actual problem to be solved is cultural (communication and coordination). It’s tempting to dismiss the proposals as pie-in-the-sky—that is until one sees the success the Dutch have had by working with the floods and surges and allowing the water to flow in, though in a controlled fashion. This June 2017 New York Times article by Michael Kimmelman shows what’s possible when communities embrace sea level rise: The Dutch Have Solutions to Rising Seas. The World Is Watching. And finally for the romantics, who love when something old turns out to be something new, here’s a recent Washington Post piece by Ben Guarino that trumpets an innovation from Ancient Roman times. It’s a concrete sea wall that, rather than being corroded by the sea, gains its strength by the interaction with salt water: Ancient Romans made world’s ‘most durable’ concrete. We might use it to stop rising seas. We are excited to report that we received 51 stellar applications to take part in the Resilient by Design Bay | Area Challenge from local, national and international teams comprised of climate scientists, landscape architects, artists, engineers, community members, filmmakers, students and many more. We are incredibly impressed by the applicant pool and wish to thank everyone for applying. This is going to be a very difficult decision for our Jury. Teams will be notified of their application status in early August and winning teams will be publicly announced at the start of the Collaborative Research Phase in September. This is a great step for community resilience efforts not just in the Bay Area, but globally as well, as the Bay Area remains a beacon of hope for both climate mitigation and adaptation efforts. Governor Jerry Brown recently announced the 2018 Climate Summit in San Francisco which will take place just after Resilient by Design’s Bay Area Challenge Teams unveil their innovative design solutions in May 2018. As part of their program Resilient by Design put out a general call for site suggestions to local residents, city staff, community and elected leaders and organizations. That deadline has just closed. It will be interesting to see if anyone put forward areas of Sausalito, or the corner of Marin County we call home. These ideas will shape our collaborative research process where Design Teams will learn about challenges and vulnerabilities all around the Bay and design experts will work with community experts to identify areas they can most effectively collaborate to create new, creative and implementable design solutions that protect the Bay Area’s most vulnerable shoreline communities from increasingly severe storms and flooding—while also addressing critical issues such as disparities in housing, income and access to open space. UPDATE – THE CALL FOR SITE SUGGESTIONS HAS BEEN EXTENDED UNTIL JULY 31 – The online site idea portal is available at http://www.resilientbayarea.org/site-ideas.